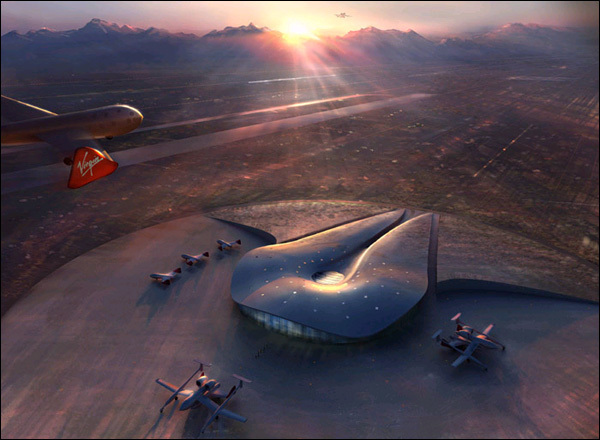 Artist's concept of the main terminal building at Spaceport America. Spaceport America is a major new spacecraft launch facility under construction near Upham, New Mexico (about 35 miles south of Roswell and 45 miles north of Las Cruces) in order to support the commercialization of space. It also lies near to the White Sands Missile Range. Previously known as the Southwest Regional Spaceport, Spaceport America was officially named by New Mexico's Economic Development Cabinet Secretary Rick Homans at the Farnborough International Airshow in Farnborough, England, on July 17, 2006. The spaceport will cover some 70 square kilometers (27 square miles) and serve as the departure point for flights by Virgin Galactic, run by billionaire adventurer and business magnate Richard Branson, who has signed a 20-year lease to use the facility. Branson's plans ultimately call for launching as many as three flights a day for two-hour rides. Spaceport America will also be the venue for the annual X Prize Cup in which rocketeers will compete in a twenty-first century version of the great aviation races of old. The 1,433-meter (4,700-foot) elevation of the site will save on the amount of jet fuel it takes to get the spacecraft to the proper altitude for launch from their mothercraft. The first X Prize Cup was held in 2005 and attracted as many as 20,000 visitors. Plans call eventually for a full launch complex, a 3,600-meter runway and aviation facility, a payload assembly complex, futuristic terminal (see below), and other site infrastructure, construction of which is scheduled to begin in 2008. According to a study released in December 2005 by aerospace industry consultant Futron Corporation, the Spaceport America could generate as much as $750m per year by 2020. New Mexico is not the only state working on a spaceport. Texas, California, Florida and Virginia also have projects, mostly on military bases. In the United States, only Spaceport America is being designed from the ground up for commercial space ventures. However, similar facilities are being planned in Singapore and the United Arab Emirates. The inaugural launch from the new spaceport took place on September 25, 2006. It involved a SpaceLoft XL carrying over 50 experiments and payloads from the private and educational sectors, worldwide. The 20-foot-tall, single-stage, 800-pound SpaceLoft XL solid-fuel rocket is designed to accelerate to five times the speed of sound, or nearly 3,400 mph, in 13.5 seconds. This maiden launch ended in failure when the rocket veered off course after reaching only 40,000 feet (12 miles). However, a second SpaceLoft XL launch (SL-2), on April 28, 2007, was successful. Aboard the rocket were a range of educational experiments and commercial payloads. In September 2007, plans for Spaceport America's terminal building and environs were made public. The terminal will be a "green" building with, according to the designers a "low-lying, organic shape" (see artist's concept above). It will be flanked by berms of earth rising out of the desert. Visitors will enter the 9,300-square-metre, $31 million facility through a channel cut in the landscape, walking between retaining walls covered with exhibits on the history of the area and of space exploration. They will be able to look down on spacecraft parked in the hangar and watch them rolling down the runway through the terminal's panoramic windows. The terminal building will be partly underground so that it is protected from the extremes of the desert climate, and will be fitted with solar panels, a water recycling system and a passive heating and cooling setup. The parched desert environs of Spaceport America are also home to Roswell, where UFO buffs maintain that an alien spacecraft crashed in 1947 and its inhabitants taken into government custody.